Professional hair colouring is one of the most difficult aspects of hairdressing. So get it done well right away, by Haarvisie’s colour masters. Haarvisie has recently introduced a revolutionary product called Olaplex, as a new treatment for radiantly coloured hair. Hair stylists are extremely enthusiastic about this new method that is used in more than 60,000 salons in America. Haarvisie is one of the first salons in the Netherlands to offer this. Anyone can colour their hair, but the results are often disappointing. Professional hair colouring is one of the most difficult aspects of hairdressing. Without knowledge of the theory of colouring, the chance of failure is always there. Haarvisie is the specialist in the field of professional hair colouring. Five Master Colour Experts are there for you in our salon, and they have taken the highest courses in the field of hair colouring. So you get full and vibrant hair. Even if the treatment at another salon failed. Do you colour your hair yourself and did it ever go wrong? Then you are not alone, as many hairdressers get customers with failed at home colourings. Doing it yourself is certainly cheaper and faster, but without the right knowledge and experience, the results are often disappointing. An example of home treatment that frequently goes wrong is lightening your coloured hair. This is only possible if you first decolourise it and then colour it with the desired blond colour. If you do not do this correctly, it can totally go wrong and – if you’re really unlucky – you’ll have bright orange hair. This may be your worst nightmare and repair is costly and time consuming. 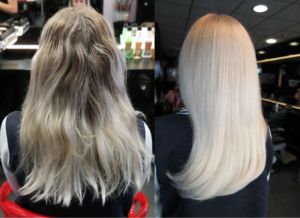 The stylists at Haarvisie have had long training for professional hair colouring and master all the techniques and styles such as: highlights, ombre colouring and smudging, free lights, free colouring, foils and water fall. Also they adjust the colours exactly to your hairstyle. This “personalised” colour sometimes consist of up to 5 colours, specially chosen for the outgrowth, lengths and ends. Hair colour from a packet contains only one colour and that difference is visible: it looks unnatural. Haarvisie takes colouring seriously, as it is demonstrated by the presence of two Master Colour Experts. This title is only given after a very intensive training, so you as a customer are guaranteed of being treated by an absolute expert, who follows trends and developments closely. Your hair is important and you want the best results. That’s why you go to Haarvisie. We’ll treat you with only top products, such as high-quality shampoos, colourings and bleaching agents. Before colouring, we always look at your personal situation. Each hair type is different and in the choice of the colour we take into account the thickness, quality and the presence of red pigments. All this affects the final result. Would you like to have your hair professionally coloured? Or have you coloured you own hair and you are not satisfied with the result? Make an appointment now at Haarvisie. We will provide you the natural and vibrant hair you deserve. You’ll only get a professional result through knowledge, insight and experience. Customers do not have those skills. A packet of hair colour is only one colour. With Haarvisie, we combine several colours and adjust them completely to your appearance. 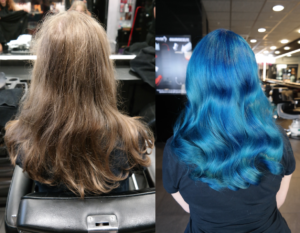 This allows for a more natural result, we create a custom colour! 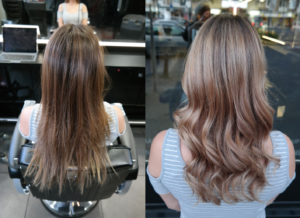 Ombre colouring, smudging or highlights? The experts at Haarvisie master all techniques and are extensively trained. We also have 2 Master Colour Experts working in our salon. This is the highest title for colour experts. An experienced stylist makes a new diagnosis before every colour treatment, and adjusts the tone and dosage to the desired result. Do you still want to colour at home? Keep it simple and, at the most, revive your own colour. For a more radical treatment, always schedule an appointment at Haarvisie to any avoid nasty surprises.